This protractor is designed to help students with vision impairment learn about, draw and measure angles. It’s made from shatter-proof plastic with tactile and matte black visual markings. Measuring 15cm in diameter, every 10 degrees is marked visually with either a black or yellow segment. Every 5 degrees is marked with a tactile notch. Place chart pin at the point of angle to be measured. Put location sleeve over chart pin. Place the semi-circular protractor on the locating sleeve by using the half circular hole on the protractor. Feeling for the straight edge of the protractor, align this edge with the raised tactile line on the German film. Secure this position with two chart pins placed in the notches where they will be out the way. Check that the edge of the protractor is in line with the tactile baseline of the angle. Find on the protractor where its zero point hits the tactile line. Follow the edge of the protractor round until it intersects with the other tactile line of the angle. Starting at the zero point, measure the number of degrees to the second line of the angle. To set up protractor, follow measuring procedures 1-5 above. 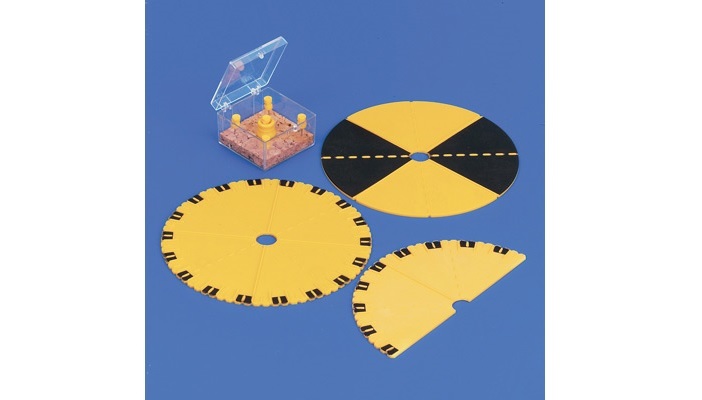 Remove locating sleeve and a securing chart pin so the protractor can be removed. Make sure a gap is left between chart pin and the board to allow ruler to be placed against the pin. Place the ruler against the centre chart pin and the other pin placed at the angle to be drawn. With a stylus, draw a line between the two points. The RNIB Online Shop sells over 1000 practical products to help blind and partially sighted people maintain their independence and keep doing the things they love.